VOTE FOR US IN BEST OF THE CITY 2016! 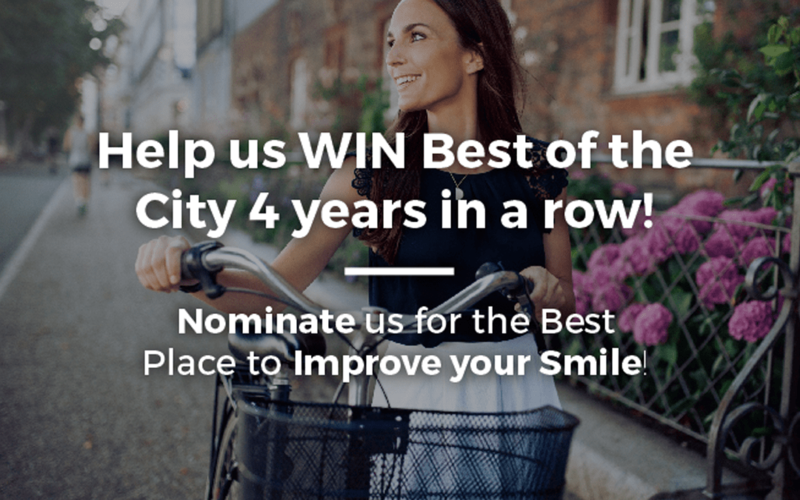 Academy Dental is so excited to be participating in this years Best of the City Competition! We’ve been voted the Best Place to Improve Your Smile for THREE years in a row. We are so thankful to everyone who has supported us over the years! We strive to be the best to keep our patients smiling! Now we need your help! We need your support again to help us win Best of the City 2016! This will be our 4th win in a row, but only YOU can get us there! It’s so easy to vote! All you have to do is follow this link, scroll down until you find the Best Place to Improve Your Smile category, and type Academy Dental into the box beside it! Then fill out 40 or more categories, click Submit and you’re done! It only takes a few minutes out of your day, but we really appreciate it. Your continual support means a lot to us! You will also be entered to win a prize! When you fill out and submit a ballot, you’ll be eligible to win $100 cash in a random draw. We love to see our patients succeed. That’s why we are committed to being the best and offering the highest level of service possible. We are thrilled to participate in a contest that allows our patients to show us how they feel! We want our patients to love us, just as much as we love them! We hope to celebrate our win with you! Don’t forget to vote before April 15th. Make sure to follow the link and fill in your vote now! If you need to schedule an appointment at Academy Dental, call our Fort Street location at (250) 385-6552, or visit us online!